This article is about the film. For the franchise, see Finding Nemo (franchise). For the video game, see Finding Nemo (video game). Finding Nemo was released on May 30, 2003; the film won the Academy Award for Best Animated Feature, and was nominated in three more categories, including Best Original Screenplay. Finding Nemo became the highest-grossing animated film at the time and was the second-highest-grossing film of 2003, earning a total of $871 million worldwide by the end of its initial theatrical run. The film is the best-selling DVD title of all time, with over 40 million copies sold as of 2006[update], and was the highest-grossing G-rated film of all time before Pixar's own Toy Story 3 overtook it. The film was re-released in 3D in 2012. In 2008, the American Film Institute named it the 10th greatest animated film ever made as part of their 10 Top 10 lists. In a 2016 poll of international critics conducted by BBC, Finding Nemo was voted one of the 100 greatest motion pictures since 2000. A sequel, Finding Dory, was released on June 17, 2016 in the United States. Nemo is a young and cheerful clownfish who lives happily with his father, Marlin in the Great Barrier Reef, Australia and is eager to explore life around the ocean, but Marlin appears to be too overprotective of him, due to a barracuda attack that killed his wife Coral and his clutch of eggs. On the first day of school, Marlin embarrasses Nemo during a field trip. When Marlin talks to the teacher, Mr. Ray, Nemo sneaks away from the reef and is captured by a scuba diver, who puts him on a boat. Marlin chases after it and meets Dory, a blue tang who suffers from short term memory loss. The pair encounter three sharks named Bruce, Anchor, and Chum. While at their meeting, Marlin sees the diver's mask that fell from the boat that took Nemo and also sees strange writing on it. However, Marlin and Dory fight over the mask, giving Dory a nose bleed. The blood sends Bruce into a feeding frenzy, and attacks Marlin and Dory, who narrowly escape. Meanwhile, Nemo is placed in an aquarium in a dentist's office, where he meets the Tank Gang, including yellow tang Bubbles, sea star Peach, cleaner shrimp Jacques, blowfish Bloat, royal gramma Gurgle, and blue and white humbug Deb, led by Gill, a Moorish idol. That night, Nemo learns he is to be given to the dentist's niece, Darla, who has killed previous fish given to her, including a goldfish named Chuckles. Gill devises a plan to escape by having a random fish in the aquarium jam the aquarium's filter with a pebble so the dentist will have to put the fish into plastic bags while the tank gets cleaned, then roll out the window and into the harbor. Nemo volunteers to do it, and Gill lets him do it. Nemo attempts to jam the filter but fails, and everybody saves him. The mask falls into a trench in the deep sea, where Dory reads the address as "P. Sherman, 42 Wallaby Way, Sydney". She remembers it despite her short term memory loss. Dory and Marlin receive directions from a school of moonfish. They are supposed to swim through a trench, but they end swimming over it, where they encounter a forest of jellyfish that almost stings them, but they remain okay. Marlin and Dory find themselves on the East Australian Current and have a good time with Crush, a green sea turtle, his son, Squirt, and all the turtles there. Marlin tells the story of his journey to the turtles, who are impressed. News of his quest spreads across the ocean. A pelican named Nigel flies to the dentist's office and brings news of Marlin's efforts to find Nemo, who makes another attempt to jam the filter, and succeeds get the aquarium covered in green algae. Marlin and Dory exit the East Australian Current and are engulfed by a blue whale. Dory communicates with the whale, who carries them to Sydney Harbor and expels them through his blowhole. There, they meet Nigel the pelican, who help the pair escape from a group of seagulls and takes them to the dentist's office. Meanwhile, the dentist has installed a new high-tech filter and the Tank Gang fail to escape. Darla arrives, and the dentist hands Nemo to her. Nemo plays dead to save himself as Nigel arrives, terrifying Darla and throwing the office into chaos. After the dentist throws Nigel out, Gill helps Nemo escape into a drain that leads to the ocean. Thinking that Nemo is dead, Marlin abandons Dory and goes home, causing her to forget. However, she meets Nemo when he reaches the ocean, but has lost her memory. Dory's memory returns when she reads the word Sydney on a drainpipe. She reunites Nemo with Marlin, but is caught in a net with a school of grouper. Nemo enters the net and orders the fish to swim down in order to break the net and they escape. After returning home to the reef, Marlin and Dory watch Mr Ray take Nemo and his friends on a field trip. Meanwhile, the dentist's new filter breaks down, and the Tank Gang escape unnoticed into Sydney Harbour. Albert Brooks as Marlin, a clownfish, Coral's husband and Nemo's father. Ellen DeGeneres as Dory, a regal blue tang with short-term memory loss. Alexander Gould as Nemo, Marlin's only surviving son, who is excited about life and exploring the ocean, but gets captured and domesticated as a pet. Willem Dafoe as Gill, a moorish idol fish living in an aquarium in a dentist clinic, and the leader of the Tank Gang. Brad Garrett as Bloat, the aquarium's porcupinefish. Allison Janney as Peach, the aquarium's starfish. Stephen Root as Bubbles, the aquarium's yellow tang fish. Austin Pendleton as Gurgle, the aquarium's royal gramma fish. Vicki Lewis as Deb/Flo, the aquarium's striped damselfish. Joe Ranft as Jacques, the aquarium's cleaner shrimp. Geoffrey Rush as Nigel, an Australian pelican, who often visits the dentist clinic and is friends with the aquarium fish. Andrew Stanton as Crush, a green sea turtle. Elizabeth Perkins as Coral, Marlin's wife and Nemo's mother. Nicholas Bird as Squirt, Crush's son. Barry Humphries as Bruce, a vegetarian great white shark, who fights his instinctive wills to eat innocent fish and is friends with Anchor and Chum. Eric Bana as Anchor, a hammerhead shark, who is friends with Bruce and Chum. Bruce Spence as Chum, a mako shark who is friends with Bruce and Anchor. Bill Hunter as The Dentist. LuLu Ebeling as Darla, the dentist's rambunctious young niece. Jordy Ranft as Tad, a butterfly fish fingerling and Nemo's school friend. Erica Beck as Pearl, a young flapjack octopus and Nemo's school friend. Erik Per Sullivan as Sheldon, a young seahorse, and Nemo's school friend. John Ratzenberger as the school of moonfish. Stanton originally planned to use flashbacks to reveal how Coral died, but realized that by the end of the film there would be nothing to reveal, deciding to show how she died at the beginning of the movie. The character of Gill also was different from the character seen in the final film. In a scene that was eventually deleted, Gill tells Nemo that he's from a place called Bad Luck Bay and that he has brothers and sisters in order to impress the young clownfish, only for the latter to find out that he was lying by listening to a patient reading a children's storybook that shares exactly the same details. 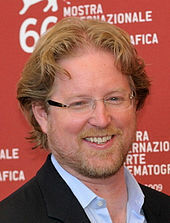 Andrew Stanton wrote and directed the film. The casting of Albert Brooks, in Stanton's opinion, "saved" the film. Brooks liked the idea of Marlin being this clownfish who isn't funny and recorded outtakes of telling very bad jokes. The idea for the initiation sequence came from a story conference between Andrew Stanton and Bob Peterson while they were driving to record the actors. Although he originally envisioned the character of Dory as male, Stanton was inspired to cast Ellen DeGeneres when he watched an episode of Ellen in which he saw her "change the subject five times before finishing one sentence". The pelican character named Gerald (who in the final film ends up swallowing and choking on Marlin and Dory) was originally a friend of Nigel. They were going to play against each other with Nigel being neat and fastidious and Gerald being scruffy and sloppy. The filmmakers could not find an appropriate scene for them that did not slow the pace of the picture, so Gerald's character was minimized. To ensure that the movements of the fish in the film were believable, the animators took a crash course in fish biology and oceanography. They visited aquariums, went diving in Hawaii and received in-house lectures from an ichthyologist. As a result, Pixar's animator for Dory, Gini Cruz Santos, integrated "the fish movement, human movement, and facial expressions to make them look and feel like real characters." Production designer Ralph Eggleston created pastel drawings to give the lighting crew led by Sharon Calahan ideas of how every scene in the film should be lit. A video game based on the film was released in 2003, for PC, Xbox, PlayStation 2, Nintendo GameCube, and Game Boy Advance. The goal of the game is to complete different levels under the roles of Nemo, Marlin or Dory. It includes cut scenes from the movie, and each clip is based on a level. It was also the last Pixar game developed by Traveller's Tales. Upon release, the game received mixed reviews. A Game Boy Advance sequel, titled Finding Nemo: The Continuing Adventures, was released in 2004. The review aggregator website Rotten Tomatoes reported a 99% approval rating, with a rating average of 8.69/10, based on 262 reviews. The site's consensus reads: "Breathtakingly lovely and grounded by the stellar efforts of a well-chosen cast, Finding Nemo adds another beautifully crafted gem to Pixar's crown." Another review aggregation website, Metacritic, which assigns a normalized rating out of 100 top reviews from mainstream critics, calculated a score of 90 out of 100, based on 38 reviews, indicating "universal acclaim." Roger Ebert gave the film four out of four stars, calling it "one of those rare movies where I wanted to sit in the front row and let the images wash out to the edges of my field of vision". Broadway star Nathan Lane, who was the voice of Timon the meerkat in The Lion King, has said Finding Nemo was his favorite animated film. Ed Park of The Village Voice gave the film a positive review, saying "It's an ocean of eye candy that tastes fresh even in this ADD-addled era of SpongeBob SquarePants." Mark Caro of the Chicago Tribune gave the film four out of four stars, saying "You connect to these sea creatures as you rarely do with humans in big-screen adventures. The result: a true sunken treasure." Hazel-Dawn Dumpert of LA Weekly gave the film a positive review, saying "As gorgeous a film as Disney's ever put out, with astonishing qualities of light, movement, surface and color at the service of the best professional imaginations money can buy." Jeff Strickler of the Star Tribune gave the film a positive review, saying it "proves that even when Pixar is not at the top of its game, it still produces better animation than some of its competitors on their best days." Gene Seymour of Newsday gave the film three-and-a-half stars out of four, saying "The underwater backdrops take your breath away. No, really. They're so lifelike, you almost feel like holding your breath while watching." Rene Rodriguez of the Miami Herald gave the film four out of four stars, saying "Parental anxiety may not be the kind of stuff children's films are usually made of, but this perfectly enchanting movie knows how to cater to its kiddie audience without condescending to them." Kenneth Turan of the Los Angeles Times gave the film three-and-a-half out of five, saying "The best break of all is that Pixar's traditionally untethered imagination can't be kept under wraps forever, and "Nemo" erupts with sea creatures that showcase Stanton and company's gift for character and peerless eye for skewering contemporary culture." Stephen Holden of The New York Times gave the film four out of five stars, saying "Visual imagination and sophisticated wit raise Finding Nemo to a level just below the peaks of Pixar's Toy Story movies and Monsters, Inc.." Terry Lawson of the Detroit Free Press gave the film three out of four, saying "As we now expect from Pixar, even the supporting fish in "Finding Nemo" are more developed as characters than any human in the Mission: Impossible movies." Claudia Puig of USA Today gave the film three and half out of four, saying "Finding Nemo is an undersea treasure. The most gorgeous of all the Pixar films—which include Toy Story 1 and 2, A Bug's Life and Monsters, Inc.—Nemo treats family audiences to a sweet, resonant story and breathtaking visuals. It may lack Monsters, Inc.'s clever humor, but kids will identify with the spunky sea fish Nemo, and adults will relate to Marlin, Nemo's devoted dad." Bruce Westbrook of the Houston Chronicle gave the film an A-, saying "Finding Nemo lives up to Pixar's high standards for wildly creative visuals, clever comedy, solid characters and an involving story." Tom Long of The Detroit News gave the film an A-, saying "A simple test of humanity: If you don't laugh aloud while watching it, you've got a battery not a heart." Lou Lumenick of the New York Post gave the film four out of four, saying "A dazzling, computer-animated fish tale with a funny, touching script and wonderful voice performances that make it an unqualified treat for all ages." Moira MacDonald of The Seattle Times gave the film four out of four, saying "Enchanting; written with an effortless blend of sweetness and silliness, and animated with such rainbow-hued beauty, you may find yourself wanting to freeze-frame it." Daphne Gordon of the Toronto Star gave the film four out of five, saying "One of the strongest releases from Disney in years, thanks to the work of Andrew Stanton, possibly one of the most successful directors you've never heard of." Ty Burr of The Boston Globe gave the film three and a half out of four, saying "Finding Nemo isn't quite up there with the company's finest work—there's finally a sense of formula setting in—but it's hands down the best family film since Monsters, Inc." C.W. Nevius of The San Francisco Chronicle gave the film four out of four, saying "The visuals pop, the fish emote and the ocean comes alive. That's in the first two minutes. After that, they do some really cool stuff." Ann Hornaday of The Washington Post gave the film a positive review, saying "Finding Nemo will engross kids with its absorbing story, brightly drawn characters and lively action, and grown-ups will be equally entertained by the film's subtle humor and the sophistication of its visuals." David Ansen of Newsweek gave the film a positive review, saying "A visual marvel, every frame packed to the gills with clever details, Finding Nemo is the best big-studio release so far this year." Richard Corliss of Time gave the film a positive review, saying "Nemo, with its ravishing underwater fantasia, manages to trump the design glamour of earlier Pixar films." Lisa Schwarzbaum of Entertainment Weekly gave the film an A, saying "In this seamless blending of technical brilliance and storytelling verve, the Pixar team has made something as marvelously soulful and innately, fluidly American as jazz." Carrie Rickey of The Philadelphia Inquirer gave the film three out of four, saying "As eye-popping as Nemo's peepers and as eccentric as this little fish with asymmetrical fins." David Germain of the Associated Press gave the film a positive review, saying "Finding Nemo is laced with smart humor and clever gags, and buoyed by another cheery story of mismatched buddies: a pair of fish voiced by Albert Brooks and Ellen DeGeneres." Anthony Lane of The New Yorker gave the film a positive review, saying "The latest flood of wizardry from Pixar, whose productions, from Toy Story onward, have lent an indispensable vigor and wit to the sagging art of mainstream animation." The 3D re-release prompted a retrospective on the film nine years after its initial release. Stephen Whitty of The Star-Ledger described it as "a genuinely funny and touching film that, in less than a decade, has established itself as a timeless classic." On the 3D re-release, Lisa Schwarzbaum of Entertainment Weekly wrote that its emotional power was deepened by "the dimensionality of the oceanic deep" where "the spatial mysteries of watery currents and floating worlds are exactly where 3D explorers were born to boldly go". 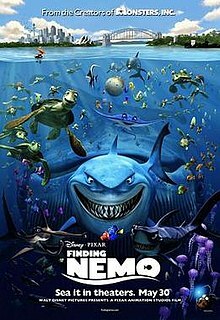 During its original theatrical run, Finding Nemo grossed $339,714,978 in North America, and $559,492,275 in other countries, for a worldwide total of $940,335,536. It is currently the forty-third-highest-grossing film, the ninth highest-grossing animated film, and the second-highest-grossing film of 2003, behind The Lord of the Rings: The Return of the King. Worldwide, it was the highest-grossing Pixar film, up until 2010, when Toy Story 3 surpassed it. The film sold an estimated 56,337,500 tickets in the US in its initial theatrical run. In North America, Finding Nemo set an opening weekend record for an animated feature, making $70,251,710 (first surpassed by Shrek 2) and ended up spending 11 weeks in the top 10 domestically (including 7 weeks in the top 5), remaining there until August 14. It became the highest-grossing animated film in North America ($339.7 million), outside North America ($528.2 million), and worldwide ($867.9 million), in all three occasions out-grossing The Lion King. In North America, it was surpassed by both Shrek 2 in 2004 and Toy Story 3 in 2010. After the re-release of The Lion King in 2011, and then Despicable Me 2 and Frozen in 2013, Minions in 2015, Zootopia, its sequel Finding Dory in 2016, Despicable Me 3 in 2017, and Incredibles 2 in 2018, passed it, it stands as the tenth highest-grossing animated film in these regions. Outside North America, it stands as the fifth-highest-grossing animated film. Worldwide, it now ranks fourth among animated films. The film had impressive box office runs in many international markets. In Japan, its highest-grossing market after North America, it grossed ¥11.2 billion ($102.4 million), becoming the highest-grossing foreign animated film in local currency (yen). It has only been surpassed by Frozen (¥25.5 billion). Following in biggest grosses are the U.K., Ireland and Malta, where it grossed £37.2 million ($67.1 million), France and the Maghreb region ($64.8 million), Germany ($53.9 million), and Spain ($29.5 million). The reaction to the film by the general public has led to environmental devastation for the clownfish, and has provoked an outcry from several environmental protection agencies, including the Marine Aquarium Council, Australia. The demand for tropical fish skyrocketed after the film's release, causing reef species decimation in Vanuatu and several other reef areas. After seeing the film, some aquarium owners released their pet fish into the ocean, but failed to release them into the correct oceanic habitat, which introduced species that are harmful to the indigenous environment, a practice that is harming reefs worldwide. Finding Nemo was released on VHS and DVD on November 4, 2003. The DVD release included an original short film, Exploring the Reef, and the short animated film, Knick Knack (1989). It would go on to become the best-selling DVD of its time, selling over 2 million units in its first two weeks of release. The film was then released on both Blu-ray and Blu-ray 3D on December 4, 2012, with both a 3-disc and a 5-disc set. In 2005, after disagreements between Disney's Michael Eisner and Pixar's Steve Jobs over the distribution of Pixar's films, Disney announced that they would be creating a new animation studio, Circle 7 Animation, to make sequels to the seven Disney-owned Pixar films (which consisted of the films released between 1995's Toy Story and 2006's Cars). The studio had put Toy Story 3 and Monster's Inc. 2: Lost in Scaradise into development, and had hired screenwriter Laurie Craig to write a draft for Finding Nemo 2. Circle 7 was subsequently shut down after Robert Iger replaced Eisner as CEO of Disney and arranged the acquisition of Pixar. In April 2013, Disney announced the sequel Finding Dory, confirming that DeGeneres and Brooks would be reprising their roles as Dory and Marlin, respectively. It was scheduled to be released on November 25, 2015, but the film's ending was revised after Pixar executives viewed Blackfish. On September 18, 2013, it was announced that the film would be pushed back to June 17, 2016. Pixar's The Good Dinosaur was moved to the November 25, 2015 slot to allow more time for production of the film. ^ a b c d "Finding Nemo (2003)". Box Office Mojo. Retrieved February 5, 2009. ^ a b "Finding Nemo (2003)". Box Office Mojo. Archived from the original on August 31, 2012. ^ a b c "Top 10 Animation". American Film Institute. Retrieved June 16, 2014. ^ "Megan Mullally – Megan Mullally Dropped From Finding Nemo". WENN. Retrieved October 1, 2014. ^ Lovgren, Stefan. "For Finding Nemo, Animators Dove into Fish Study". National Geographic News. Retrieved October 30, 2012. ^ 31st Annual Annie Awards, 31st Annual Annie Award Nominees and Winners (2003). Retrieved June 12, 2014, "… Character Animation… Gini Santos Finding Nemo…"
^ Rizvi, Samad. "Remembering Glenn McQueen, 1960-2002". Pixar Times. Retrieved November 8, 2012. ^ Henley, Jon (February 24, 2004). "Nemo finds way to French court" – via www.theguardian.com. ^ Aude Lagorce (December 3, 2004). "French Court Denies Disney Ban". Forbes. Retrieved September 30, 2012. ^ "Aggregate score for GBA at GameRankings". ^ "Aggregate score for PS2 at Metacritic". ^ "PS2 review at GameSpot". ^ "Game Boy Advance review at GameSpy". Archived from the original on December 31, 2005. ^ "PS2 review at GameSpy". ^ "PS2 review at IGN". ^ Adams, David (September 16, 2004). "Shipping Nemo". IGN. Retrieved February 24, 2014. ^ "Finding Nemo (2003)". Rotten Tomatoes. Retrieved March 20, 2019. ^ "Finding Nemo". Metacritic. Retrieved October 18, 2013. ^ Roger Ebert (May 30, 2003). "Finding Nemo Review– rogerebert.com". Chicago Sun-Times. Retrieved October 1, 2014. ^ "Nathan Lane's Favorite Animated Movie? FINDING NEMO". YouTube. American Film Institute. August 19, 2009. Retrieved September 18, 2012. ^ Ed Park (May 27, 2003). "Gods and Sea Monsters – Page 1 - Movies – New York". The Village Voice. Retrieved January 10, 2014. ^ Caro, Mark. "Metromix.com: Movie review: 'Finding Nemo'". Chicago Tribune. Archived from the original on February 17, 2004. Retrieved January 10, 2014. ^ a b c d e f g h i j "Finding Nemo – Movie Reviews". Rotten Tomatoes. Retrieved January 10, 2014. ^ "Movie: Finding Nemo". Archived from the original on June 4, 2003. Retrieved January 10, 2014. ^ Turan, Kenneth (May 30, 2003). "Hook, line and sinker ". Los Angeles Times. Retrieved January 10, 2014. ^ Holden, Stephen (May 30, 2003). "Movie Review – Finding Nemo – FILM REVIEW; Vast Sea, Tiny Fish, Big Crisis". The New York Times. Retrieved January 10, 2014. ^ "Movie: Finding Nemo". Archived from the original on August 25, 2003. Retrieved January 10, 2014. ^ Puig, Claudia (May 29, 2003). "USATODAY.com – Sweet and funny 'Nemo' works just swimmingly". USA Today. Retrieved January 10, 2014. ^ "Finding Nemo". Houston Chronicle. Archived from the original on September 2005. Retrieved January 10, 2014. ^ C.W. Nevius (May 30, 2003). "Pixar splashes 'Finding Nemo' in a sea of colors". San Francisco Chronicle. Retrieved January 10, 2014. ^ Ansen, David (June 1, 2003). "Freeing Nemo: A Whale Of A Tale". Newsweek. Retrieved January 10, 2014. ^ Corliss, Richard (May 19, 2003). "Hook, Line and Thinker ". TIME. Retrieved January 10, 2014. ^ Lisa Schwarzbaum (June 13, 2003). "FINDING NEMO Review | Movie Reviews and News". Entertainment Weekly. Retrieved January 10, 2014. ^ David Germain (May 29, 2003). "Miscellaneous: At the Movies - 'Finding Nemo' (05/29/03)". Southeast Missourian. Retrieved January 10, 2014. ^ Lane, Anthony. "Finding Nemo". The New Yorker. Retrieved January 10, 2014. ^ Whitty, Stephen. "Finding Nemo 3D review". The Star-Ledger. Retrieved October 2, 2012. ^ Schwarzbaum, Lisa (September 15, 2012). "Finding Nemo 3D". Entertainment Weekly. Retrieved September 16, 2012. ^ "Top Grossing Films of 2003". Boxofficemojo.com. ^ "Pixar". Boxofficemojo.com. Retrieved September 10, 2010. ^ "Weekend Box Office Results for May 30-June 1, 2003". Box Office Mojo. June 1, 2003. Retrieved January 11, 2014. ^ "Finding Nemo (2003)". Box Office Mojo. Retrieved January 11, 2014. ^ "WORLDWIDE GROSSES". Boxofficemojo.com. Retrieved September 10, 2010. ^ "Animation". Boxofficemojo.com. Retrieved September 10, 2010. ^ Subers, Ray (August 29, 2010). "'Toy Story 3' Reaches $1 Billion". Box Office Mojo. Amazon.com. Retrieved August 30, 2010. ^ "歴代興収ベスト100". 歴代ランキング. Retrieved December 12, 2018. ^ "Box Office Mojo International". Boxofficemojo.com. Retrieved September 10, 2010. ^ Segers, Frank (September 16, 2012). "Foreign Box Office: 'Resident Evil: Retribution' Rules Overseas, Grossing $50 Million in 65 Markets". The Hollywood Reporter. Retrieved September 17, 2012. ^ "Weekend Report: 'Resident Evil 5,' 'Nemo 3D' Lead Another Slow Weekend". Box Office Mojo. Retrieved September 17, 2012. ^ "Finding Nemo - 2003 Academy Awards Profile". Boxofficemojo.com. May 30, 2003. Retrieved January 9, 2014. ^ a b c "Finding-Nemo – Cast, Crew, Director and Awards". The New York Times. Retrieved January 9, 2014. ^ a b "AFI Crowns Top 10 Films in 10 Classic Genres". ComingSoon.net. American Film Institute. June 17, 2008. Retrieved August 18, 2008. ^ Jackson, Elizabeth (November 29, 2002). "Acquiring Nemo". The Business Report. Archived from the original on December 4, 2003. Retrieved November 10, 2006. ^ Corcoran, Mark (November 9, 2002). "Vanuatu – Saving Nemo". ABC Foreign Correspondent. Archived from the original on December 19, 2005. Retrieved October 23, 2006. ^ "Tourism authorities hope "Nemo" will lead Chinese tourists to Australia". China Daily. August 18, 2003. Archived from the original on October 7, 2003. Retrieved April 27, 2017. ^ Mitchell, Peter (November 3, 2002). "Nemo-led recovery hope". The Age. Melbourne, Australia. Retrieved October 23, 2006. ^ Dennis, Anthony (February 11, 2003). "Sydney ignores Nemo". The Sydney Morning Herald. Retrieved October 23, 2006. ^ "Clown Anemonefish". Nat Geo Wild : Animals. National Geographic Society. Archived from the original on December 19, 2011. Retrieved December 19, 2011. ^ "Nemo: Leave him in the ocean, not in the lounge room". Oceans Enterprises. Archived from the original on September 29, 2018. Retrieved December 4, 2018. ^ Arthur, Charles (July 1, 2004). "'Finding Nemo' pets harm ocean ecology". The Independent. London. ^ Brylske, Alex. "Revealing Nemo's True Colors". Dive Training Magazine. ^ "Finding Nemo DVD". Blu-ray.com. November 4, 2003. Retrieved January 9, 2014. ^ "The No. 1 Film of the Year Becomes The No. 1 DVD on Nov. 4! ; Walt Disney Pictures Presentation of a Pixar Animation Studios Film Finding Nemo". Business Wire. July 28, 2003. Retrieved November 22, 2013. ^ 2003 Annual Report (Report). The Walt Disney Company. 2004. ^ "Finding Nemo Hitting 2D and 3D Blu-ray on December 4". ComingSoon.net. June 1, 2012. ^ "Finding Nemo (An Original Soundtrack)". AllMusic. Retrieved August 8, 2013. ^ "iTunes – Music – Finding Nemo (An Original Soundtrack) by Thomas Newman". iTunes Store. May 20, 2003. Retrieved April 17, 2014. ^ "2003 Academy Awards Nominations and Winners by Category". Boxofficemojo.com. Retrieved April 17, 2014. ^ "The Seas with Nemo & Friends | Walt Disney World Resort". Disney. Retrieved January 11, 2014. ^ "Finding Nemo: Submarine Voyage at Disneyland". Themeparkinsider.com. January 6, 2014. Retrieved January 11, 2014. ^ "Finding Nemo-The Musical | Walt Disney World Resort". Disney. Retrieved January 11, 2014. ^ Hill, Jim (August 7, 2005). "The Skinny on Circle Seven". Retrieved March 27, 2012. ^ Armstrong, Josh (March 5, 2012). "Bob Hilgenberg and Rob Muir on the Rise and Fall of Disney's Circle 7 Animation". Retrieved March 27, 2012. ^ "'John Carter' Helmer Andrew Stanton Dives Back into Animation With 'Finding Nemo' Sequel". Deadline.com. Retrieved July 18, 2012. ^ Kit, Borys (July 17, 2012). "Andrew Stanton to Direct Pixar's 'Finding Nemo' Sequel". The Hollywood Reporter. Retrieved July 17, 2012. ^ Cooper, Gael Fashingbauer; Garcia, Courtney (July 18, 2012). "Sequel to 'Finding Nemo'? Maybe. 'Toy Story 4'? Not so fast ..." NBCNews.com. Retrieved October 3, 2015. ^ Rose, Lacey (August 21, 2012). "Ellen DeGeneres in Talks to Return for 'Finding Nemo' Sequel (Exclusive)". The Hollywood Reporter. Retrieved August 22, 2012. ^ Keegan, Rebecca (September 8, 2012). "Director Andrew Stanton looks back on 'John Carter's' rocky path". Los Angeles Times. Retrieved September 8, 2012. ^ Fleming Jr., Mike (February 12, 2013). "Albert Brooks Hooks Deal To Reprise In 'Finding Nemo 2'". Deadline. Retrieved February 12, 2013. ^ Kit, Borys (July 7, 2012). "Andrew Stanton to Direct Pixar's 'Finding Nemo' Sequel". The Hollywood Reporter. Retrieved April 2, 2013. ^ Farley, Christopher John (April 2, 2013). "Ellen DeGeneres to Star in 'Nemo' Sequel 'Finding Dory'". The Wall Street Journal. Retrieved April 2, 2013. ^ Kaufman, Amy (August 9, 2013). "'Blackfish' gives Pixar second thoughts on 'Finding Dory' plot". Los Angeles Times. Retrieved August 9, 2013. ^ Barnes, Brooks (August 9, 2013). "'Finding Nemo' Sequel Is Altered in Response to Orcas Documentary". The New York Times. Retrieved August 10, 2013. ^ Lussier, Germain (September 18, 2013). "Pixar Skips 2014 as 'The Good Dinosaur' Shifts to 2015 and 'Finding Dory' to 2016". /Film. Retrieved September 27, 2013. Wikimedia Commons has media related to Finding Nemo.